All-weather wicker armchair, ottomans & sectional provide plenty of comfortable seating around this set's 60-inch table. 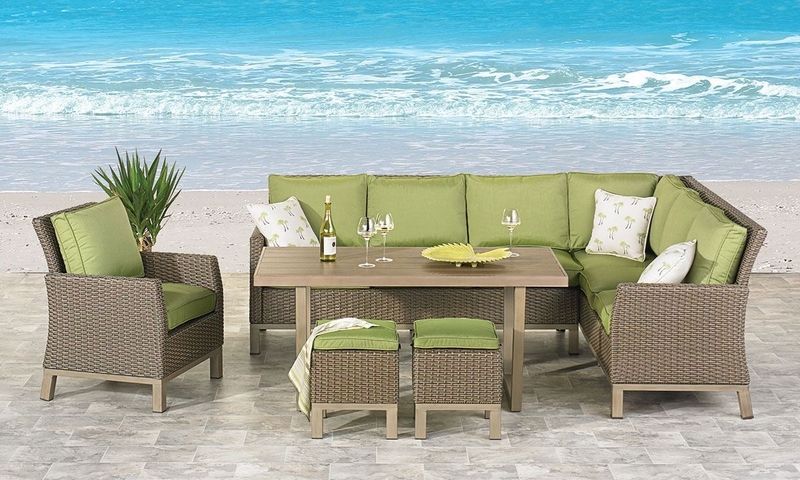 Comfortably lounge, gather and dine outdoors with the Long Beach collection. This banquette style set includes a track arm sectional, matching chair, two ottomans, and a 60-inch table with brushed beige aluminum frames. The muted green Sunbrella® cushions are made to resist fading from long days in the sun, and the neutral resin wicker and poly lumber table top won’t splinter or crack in the harsh outdoor elements.